3asyRide is a retail installment sales contract with a balloon payment. Financing provided to well-qualified customers financing their purchase of new eligible BMW motorcycles by participating BMW motorcycle dealers and assigned to BMW Financial Services NA, LLC or BMW Bank of North America. The $68 monthly payment on a G 310 GS is based on $5,795 MSRP + $495 Destination, 48 month contract, 1.9% APR, $447 down payment and $3,003 balloon due at the end of the term. The $119 monthly payment on an F 750 GS is based on $12,795 MSRP + $495 Destination, 48 month contract, 0.9% APR, $1,633 down payment and $6,246 balloon due at the end of the term. The $149 monthly payment on an F 850 GS is based on $15.595 MSRP + $495 Destination, 48 month contract, 0.9% APR, $1,750 down payment and $7,562 balloon due at the end of the term. The $219 monthly payment on a R 1250 GS is based on $18,695 MSRP + $495 Destination, 48 month contract, 4,4% APR, $1,996 down payment and $9,019 balloon due at the end of the term. Interest will accrue during 30 days to first payment. Not all customers will qualify for all incentives. Additional options and accessories are not included and may increase your monthly payment. Down payment, monthly payment, and other credit terms depend upon motorcycle model, state, applicant’s creditworthiness, amount financed and length of contract term. This is not an offer of any particular purchase or financing transaction. Excludes tax, title and registration fees. Program not offered in NV, ND, NH, PA, and WV. In all other states, the amount financed must be at least $5,000. The total amount financed must be greater than $10,000 in HI and MD. In NJ the selling price must exceed $10,000. In NC, selling must exceed $7,500. 3asyRide products may not be used in ME for contracts with a term of less than 48 months. 3asy Ride rate is a minimum of 4.4% APR in the following states: AL, HI, IA, ID, IN, KS, KY, MI, OH, OK, SC, VA and WA. Subject to credit approval. Actual credit terms for an approved client may differ based on applicant’s creditworthiness, amount financed, and length of term. Some sales programs cannot be combined. Offer valid through 6/30/19. Please see your BMW Motorrad dealer for details. 3asyRide is a retail installment sales contract with a balloon payment. Financing provided to well-qualified customers financing their purchase of new eligible BMW motorcycles by participating BMW motorcycle dealers and assigned to BMW Financial Services NA, LLC or BMW Bank of North America. The $68 monthly payment on a G 310 GS is based on $5,795 MSRP + $495 Destination, 48 month contract, 4.4% APR, $400 3asyRide Credit, $479 down payment and $3,003 balloon due at the end of the term. The $119 monthly payment on an F 750 GS is based on $12,795 MSRP + $495 Destination, 48 month contract, 4.4% APR, $1000 3asyRide Credit, $1,800 down payment and $6,246 balloon due at the end of the term. 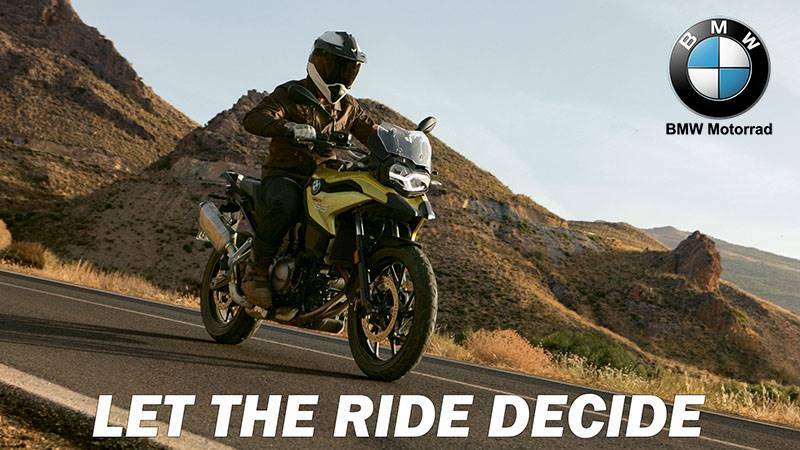 The $149 monthly payment on an F 850 GS is based on $15.595 MSRP + $495 Destination, 48 month contract, 4.4% APR, $1,250 3asyRide Credit, $1,928 down payment and $7,562 balloon due at the end of the term. The $219 monthly payment on a R 1250 GS is based on $18,695 MSRP + $495 Destination, 48 month contract, 4,4% APR, $1,996 down payment and $9,019 balloon due at the end of the term. Interest will accrue during 30 days to first payment. Not all customers will qualify for all incentives. Additional options and accessories are not included and may increase your monthly payment. Down payment, monthly payment, and other credit terms depend upon motorcycle model, state, applicant’s creditworthiness, amount financed and length of contract term. This is not an offer of any particular purchase or financing transaction. Excludes tax, title and registration fees. Program not offered in NV, ND, NH, PA, and WV. In all other states, the amount financed must be at least $5,000. The total amount financed must be greater than $10,000 in HI and MD. In NJ the selling price must exceed $10,000. In NC, selling must exceed $7,500. 3asyRide products may not be used in ME for contracts with a term of less than 48 months. 3asy Ride rate is a minimum of 4.4% APR in the following states: AL, HI, IA, ID, IN, KS, KY, MI, OH, OK, SC, VA and WA. Subject to credit approval. Actual credit terms for an approved client may differ based on applicant’s creditworthiness, amount financed, and length of term. Some sales programs cannot be combined. Offer valid through 6/30/19. Please see your BMW Motorrad dealer for details.